"This recipe for homemade funnel cakes brings the deep-fried carnival treat home to you!" Good when you're feeling nostalgic...though I don't remember them being so crispy at Six Flags. 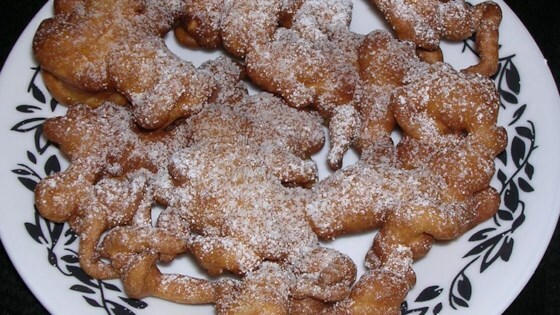 Since making these I tried "Funnel Cakes I" from this site, and they were much more authentic. Very easy and tasty recipe!!! Adding the vanilla is a MUST!! Using the "ketchup bottle" was a great idea, makes it much easier to fry!! Thanks!! Turned out great, we didn't have a funnel so cut out a corner of a zip lock bag and it worked out great. Thanks for the post.